Mailbag: What are the roster needs of the teams picking immediately ahead of the Eagles? The Eagles will certainly know the roster needs of the teams drafting ahead of them on draft weekend. In our weekly Eagles chat on Wednesday, there were a lot of questions that we could not get to in time or other questions we did answer but could use more color. And so, let's do a mailbag post to answer some of the overflow. Question from IHPWIC: What are the biggest needs of the five teams picking prior to the Eagles? Yeah, OK, that’s maybe worth a look. I think that the trading up is the least likely of the Eagles' options in this draft, but it's not out of the question. 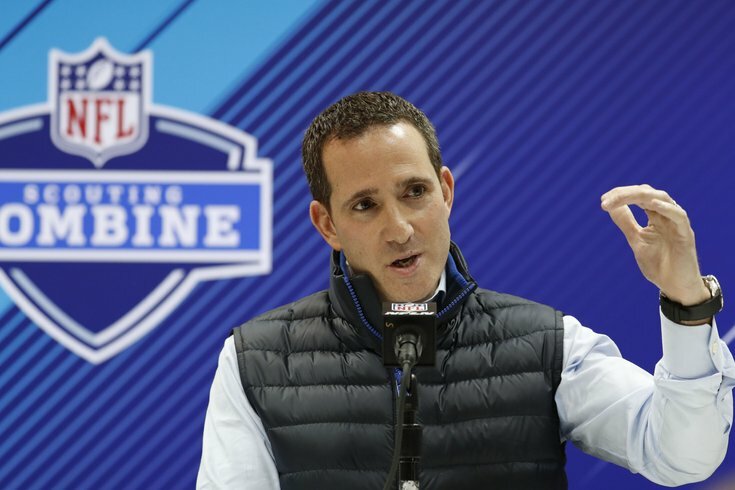 If there's a player the Eagles have rated very highly that falls to the back of the first round, certainly they should know the needs of the teams immediately in front of them, and whether or not they need to jump ahead of them for that guy. Mike McGlinchey would love to play for hometown Eagles — but will Penn Charter grad be there at No. 32? • 31 (Patriots): They need help on defense. Their secondary was obviously a major issue in the Super Bowl after they benched Malcolm Butler, who signed with the Titans. They also need to find a long-term replacement to groom behind Tom Brady, and who knows what's happening with Gronk. • 30 (Vikings): When I put out my matchups to watch against the Vikings prior to the NFC Championship Game, the biggest advantage in that game was the Eagles’ defensive line against the Vikings’ offensive line. Minnesota needs to get better there, or it’s going to be very hard for them to get past teams that have a good pass rush like Philly in the playoffs. • 29 (Jaguars): I’m not a believer in Blake Bortles, but the Jags are too far down in the draft to do anything about that this year. After losing Allen Robinson and Allen Hurns, the Jags added Donte Moncrief, but that’s not enough. I could see them adding to the receiving corps. • 28 (Steelers): It’s been a long time since the Steelers didn’t have really good inside linebackers, but that’s where they are now after Ryan Shazier’s scary, and potentially career-ending injury. • 27 (Saints): New Orleans has an obvious hole at tight end. Finding an immediate contributor in the draft at that spot would give the Saints’ already great offense yet another weapon. They can also use some help at linebacker. Question from Hinkie: Which Eagle do you think is most likely to take a step forward and improve their play this year? Alternatively, who do you think will regress and not live up to their play of last season? I asked Doug the same question at the Annual Meeting in Orlando a month ago. Well, the first part of that question, anyway. Here’s what he said. On the “step forward” part, I’m going to say Nate Sudfeld. Even though the Eagles didn’t put any points on the board in their regular season finale against Dallas last year, I though Sudfeld showed a lot of positive traits. He may not play at all in 2018, but I think he’s going to turn some heads in training camp. On the “step back” part, that’s really a tough one. I think that maybe an obvious answer, but one that some might not want to hear, is Carson Wentz. He was having an MVP-caliber season in 2017. It’s going to be really hard for him to repeat what he did last year while learning to trust his knee and trying to re-gain the mobility he had. Question from Dubya: Is there any legitimacy to the noise that Connor Williams will drop because of his arm length? He’s the best OT in the draft, in my opinion, and would be a steal at pick 32. Yep, he has 33” arms, which is definitely a concern for an offensive tackle in the NFL. He’s also only 6’5, 296. That’s way smaller than ideal. And then there are concerns about the season that he had in 2017, which did not match his play in 2016. In 2016, he was being thought of by many as a future top 10 pick, but injuries hurt his play last season. In 2013, Justin Pugh was an undersized OT at 6’4, 307, with even shorter 32” arms, and he went 19th overall. In my view, Williams is a way better prospect than Pugh was, and he projects similarly to the NFL, in that if it doesn’t work out at tackle, he should be able to become a good starter at guard. When you look at the needs of teams around the league, the majority of them need offensive line help, some desperately so. I agree with you that it feels unlikely that he’ll slide all the way to 32. Question from Nani: Am I the only one who sees Nate Allen when I watch Justin Reid? Hmm… Thinking of why you might come up with that comp. When I think of Nate Allen, I think of a guy who mostly played centerfield, wasn’t often tasked with slot receiver duties, never made any big hits, and would bite the cheese on underneath routes, giving up big plays behind him due to a lack of football instincts, even though he was a smart, thoughtful person off the field. The only real similarity between Reid and Allen, in my view, is that he’s not a lethal hitter, like, say, Karl Joseph a couple years ago. Otherwise, Reid is better in the slot in coverage, he’s a more instinctive player, he’s a more reliable tackler despite the lack of pop, and he’s a better athlete. Question from Office Linebacker: Are you surprised there hasn’t been a Brandon Graham extension yet? Nah. Big money deals take time. A couple years ago, Fletcher Cox didn’t sign his contract extension until June 13. I think they’ll ultimately get something done, as they should, but it’s only April. Still plenty of time. Question from Hinkie: How far do you think the Sixers go in the playoffs? I think they lose in the NBA Finals.